Going back as far back as 1984, IBM has included sexual orientation in its non-discrimination policy. In 1995, it established an LGBT+ executive task force focused on making the company a safe and desirable workplace for everyone. It’s about supporting an inclusive workplace where every IBMer can say, “I believe, I belong, I matter,” according to Ayman Antoun, president of IBM Canada. More recently, the company has included the concept of “ally membership” in its LGBT+ community, and when, in 2017, it became apparent the number of allies had to started to decline at the company, along with active participation in the LGBT+ community, IBM decided to take action. So, in May 2017, a global “365 Ally Engagement” initiative was launched, led by Nancy McTavish, who is also global leader for business agility at IBM, which has 366,600 employees globally. The mandate was to accelerate the engagement of new and existing IBMers as allies by delivering a strategic program that leverages the Pride@IBM portal, an online platform where IBMers can share news, upcoming events or videos. “Essentially, our goal was to put a strategic, global program in place to increase the number of IBMers pledging to be allies, and drive a measurable increase in engagement,” says McTavish. The program involved three focus areas. In the first, IBM launched an online learning module to promote awareness and advocacy, particularly for those who know, manage and work with LGBT+ colleagues. IBMers were encouraged to complete the module, sign an ally pledge, and engage their local business resource group (BRG) to help make a difference for LGBT+ friends and colleagues. This program was actually made commercially available to clients, she says, and saw people becoming LGBT+ allies by going through various modules that talked about what it’s like to be an ally and some of the challenges associated with the community. “As an IBMer, I would go into the learning collection and take a course there and, at end of the course, I have the option to sign a pledge… to be an ally and advocate on behalf of the community, so that’s how we collect that data,” says McTavish. The second part of the initiative saw the establishment of an ally advisory group to help create innovative programs and initiatives. The first IBM ally was also featured as part of a pride profile series, communicated through the Pride@IBM portal that showcased the personal journey to becoming an ally, while demonstrating the importance of demonstrating advocacy as an integral part of supporting a culture of inclusiveness. The third element of 365 Ally Engagement involved new tools to support LGBT+ leaders. That meant 365 Ally Engagement was featured on the Pride@IBM portal, a playbook was designed to support a BRG ally program launch, and an overview document was created for allies to use as conversation starters. Senior executives also delivered “Why being an ally is important” videos to increase awareness and understanding. “IBM provides a really supportive environment for leaders to engage in these types of initiatives, and, of course, visible leadership is key, so our senior executives really embraced this enthusiastically,” says McTavish. When 365 Ally Engagement launched in 2017, IBM Canada hoped to see an increase of 20 per cent in IBMers pledging to be allies — within six months, it saw a 167 per cent increase. And, just recently, a badge was developed and approved for launch, says McTavish. Those activities could include involvement with the local BRG, participation in a panel event, presenting on behalf of the community at internal or external events, and being “visible socially within our own internal community sharing their allied story of why they feel it’s important to be an ally,” she says. Of course, IBM has other initiatives around diversity and inclusion. The company uses an engagement survey to capture employees’ views of inclusion in the workplace, and to develop action plans to enhance the workplace culture. Recent results led to the development of an IBM engagement toolkit, designed to educate leaders on all facets of diversity and inclusion. More recently, in January 2018, senior executives attended a boot camp on inclusion to hear about new research on unconscious bias and diversity and inclusion, and to learn how to put initiatives from HR into practice. Accountability of IBM’s executive diversity councils was also increased, with achievements reported to the board of directors. IBM managers are also required to have a diverse candidate slate for open positions. The company has a formalized diversity recruitment framework to track applications and ensure resumés are reviewed without bias by hiring managers. And all new hires are provided with information on how to access IBM’s “concerns and appeals” channel, Open Door, to bring concerns directly to senior management. 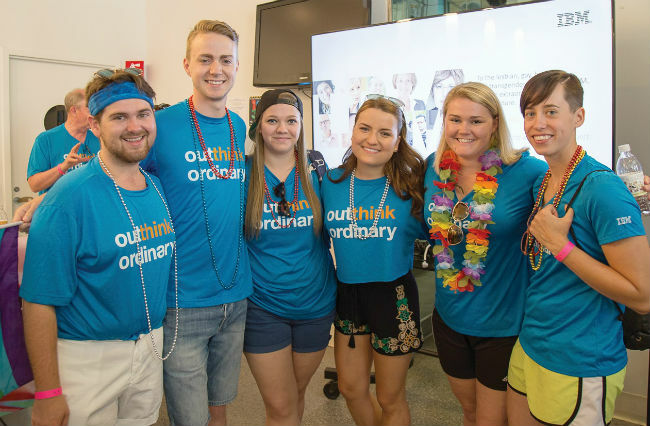 “IBM has a longstanding commitment to equal opportunity and a firm belief that being an IBMer is bringing your full self to work every day,” says McTavish.